So, what's it to be: a few drinks or a new software instrument? NAMM 2016: Sonivox has a theory that a lot of people end up paying top-whack for virtual instruments and then not using all of their features and patches. That's hardly cost-effective, so the company's solution is to release Singles, a range of affordable plugins that put the focus on one type of sound each. Prices start at $20, but Sonivox is keen to stress that Singles' ease of use and affordability doesn't come at the expense of sound quality. "Forget for a minute that these instruments cost less than going out for lunch, or are easily programmed with a slick interface," says Jennifer Hruska, Director of Content Development for inMusic Brands, which owns Sonivox. "The bottom line is they sound incredible and are really fun to play!" There are currently five titles in the range - Harpsichord, Blue Jay Drums, Classic Bass, Bright Electric Guitar and Harmonica - but we're told to expect 35 more in the coming months. The key features are below, and you can find out more on the Sonivox website. Synthesis engine technology developed in-house by SONiVOX includes Master, Envelope, Filter, and LFO controls. Each Single includes powerful effects provided by leading developers AIR Music Tech and Izotope (effects vary per title). 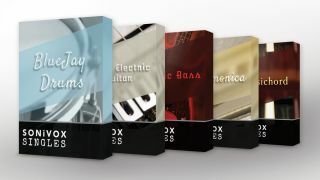 The full Singles collection includes orchestral instruments, vintage keyboards, ethnic tonal and percussion instruments, electronic instruments, guitars, basses and more. Includes full support for the industry standard Virtual Instrument Player (VIP) software provided with select Akai Pro and Alesis Keyboards.